Bok choy is classified as a cabbage, sometimes called as chinese cabbage, mustard cabbage, chinese celery or peking cabbage. It has glossy dark green leaves and thick and crisp white stalks in loose head. It has as light , sweet flavour, crispy texture and good nutritional values. 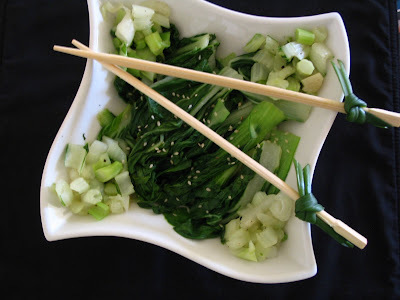 Bok choy is very nutritios, it is high in vitamin A,C rich in potassium and calcium. They similarly tastes like swiss chard. It tastes so good when lightly cooked over cooking spoils the tastes. 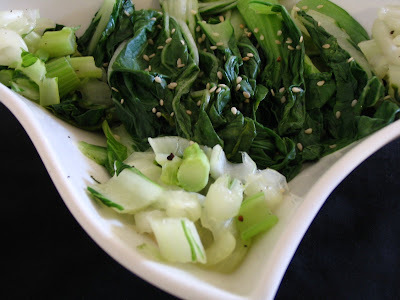 Bok choy is one of those good vegetable that can be quick cooked, steamed or stir fried. Baby bok choy is also available in the market anything can be used and cook like swiss chard. Red chilli flakes or pepper anything of ur choice. 1. Wash the bok choy and cut the leafy portion and stems seperately into big pieces 3/4 inch atleast . Too thin makes watery. 2. Heat oil in the frying pan and add crushed garlic and red chilli flakes. 3. Then first add stems and stir fry for just few seconds , then add the green part. 4. Saute for few seconds add salt and pepper. Now add sesame oil and seeds. 5. Serve hot with Jasmine rice or fried rice or even u can eat like a snack too. 1. To get the saucy consistency you can add the cornflour mixture. 2. You can also make gobi manchurian sauce and add the fried greens to it tastes so yummy , refer the gobi manchurian sauce in my post. And serve it with vegetable noodles. 3. This bokchoy can be substituted by swiss chard or kale. 4. Do not saute for too long until water is absorbed .. it becomes soggy and spoils the crunchiness. U have a fantabulous talent anni... Good innovation, good observation, good decoration, good photography!!! Great!! Pavithra, this is such an easy dish to make but has loads and loads of nutritional values!!! Am gonna make this soon for sure!!! Delicious! i love bok choy and never made it at home yet! Thanks for the recipe! 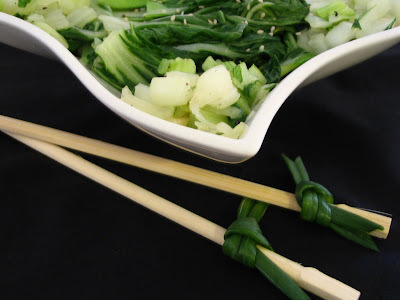 I love bok choy and it is so much available in chinatwon - big bok choy,baby bok choy, bok choy cousins - its all there...once again you made a simple dish look so beautiful. as usual good pic and awesome dish! I do often bokchoy stir fry too...lovely dih! BTW,you could try the burji with either soya nuggets/tofu-tastes great! Very nutritious & delicious dish. Wow simple but highly nutritious! And amazing presentation! Easy dish, nutritious. Looks delicious. Wonderful presentation as always! health packed dish. Easy and a must eat! Nice n healthy dish lol..love the cute knots on the chop sticks..
fantastic decoration Pavithra..i just keep staring at those pics!!! Never tried this veggie pavithra..Those pics are tempting me to make this..yummy.. I have never cooked with bok choy. This recipe looks delicious and healthy. Thanks! I always admire ur presentaion skills, looks so inviting. SO does the rawa pilaf too. oh.. i think i posted comment for this dish in wrong post..